the Valspar Championship golf tournament at Innisbrook Resort - Copperhead Course. PALM HARBOR – All week long Tiger Woods was the only story above the fold at the Valspar Championship, the former world No. 1 once again producing page-grabbing material with eye-opening play in front of record-setting crowds craving a glimpse of what once was. Paul Casey, however, produced a rewrite on what would have been a remarkable tale of redemption for Woods, who was trying to win for the first time in five years. Casey had his own doubts to deal with and ended a winless drought on the PGA Tour of nine years with a one-shot victory over Woods and Patrick Reed on the Copperhead Course at Innisbrook Golf Resort. “Means a lot. It’s been too long,” said Casey, who shot a sparkling 6-under-par 65 to finish at 10 under to win his second PGA Tour title but first since the 2009 Shell Houston Open. While he’s won 13 titles on the European Tour, doubts started creeping into his head about winning again on the PGA Tour. “It’s very satisfying, especially coming in a week where Tiger played so well and you heard the roars again,” Casey said. 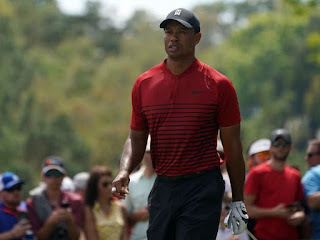 Woods, repeatedly written off by critics after one dismal comeback after another and bedridden with constant pain just a year ago, showed his latest return is different as he is healthy of body, mind and spirit. Whole again after spinal fusion surgery 11 months ago, Woods grabbed a share of the lead early in the final round in just his fourth start on the PGA Tour since being sidelined for a year. While an uncooperative putter proved to be his downfall, he did come charging late with a birdie from 43 feet on the 71st hole left him one behind. But his 39-foot birdie chance to force a playoff on the 72nd hole fell two feet short. He shot 70 and for the first time since 2013, he broke par in all four rounds in a tournament. “My game was quite solid this entire week,” said Woods, who will play this week’s Arnold Palmer Invitational, which he has won a record eight times. “As a whole, I felt very good about what I did this week. I believe my game is progressing. There were times that even Woods didn’t know if he would get out here again. Two years ago he said he couldn’t see the light at the end of the tunnel. During last year’s Presidents Cup he said he had no idea what his future held. But 11 months after his spine was fused, 10 months after his DUI put his mugshot on the front pages of sports sections the world over, and just five months since doctors gave him the go-ahead for full golf activities without restrictions, Woods seems to have the building blocks in order. Unlike previous attempts to resurrect his career – his comeback at the end of 2016 and into 2017 lasted just seven rounds – this is a different Woods. When he got the go-ahead from his doctors, Woods quickly regained his swing speed and his power was along for the ride. His short game was in order. What he needed, he said, were competitive rounds to produce rhythm to playing professional golf again, a cadence that would keep him sharp. Shortly into his comeback, Woods reached a point where he started saying he just had to clean up his game and stay away from stupid mistakes to become a contender again. That time has arrived. Els spent 17 consecutive years ranked in the top 10 going toe-to-toe with Woods, who he has known for a quarter of a century. During the worst of times, Els had doubts Woods would ever return. “I’m seeing the normal Tiger. The Tiger that was not quite the same guy was because of the injuries,” Els said. “Who knows how bad it was? And he just went through a tough time there and he’s now back. “He’s swinging hard, he’s swinging with confidence. And with that, knowing that his back is going to be fine, you have a future now. You can plan things and look to them with excitement instead of going week to week wondering if something is going to break. He has that energy believing that his body is back and he has the talent and he’s done the work. I’m seeing good things. One of those youngsters is Justin Thomas, 25, the reigning PGA Tour player of the year. Thomas, who watched the tournament from his home, is a frequent practice round partner with Woods. Last year he started going over to Woods’ palatial seaside estate in Jupiter, Fla., for putting and chipping contests in the backyard. Those turned into practice rounds once Woods got healthy. 0 Response to "Tiger Woods ties for second at Valspar despite late birdie"